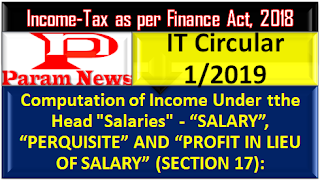 COMPUTATION OF INCOME UNDER THE HEAD "SALARIES"
Any salary, bonus, commission or remuneration, by whatever name called, due to, or received by, a partner of a firm from the firm shall not be regarded as "Salary". i. wages, fees, commissions, perquisites, profits in lieu of, or, in addition to salary, advance of salary, annuity or pension, gratuity, payments in respect of encashment of leave etc. iii. the contribution made by the Central Government or any other employer to the account of the employee under the New Pension Scheme as notified vide Notification F.N. 5/7/2003-ECB&PR dated 22.12.2003(enclosed as Annexure VII) referred to in section 80CCD (para 5.5.3of this Circular). Family Pension is chargeable to tax under head "Income from other sources" and not under the head-Salaries. Therefore, provisions of section 192 of the Act are not applicable. Hence, DDOs are not required to deduct TDS on family pension paid to person. iii) By an employer (including a company)to an employee, who is not covered by (i) or (ii) above and whose income under the head "Salaries" (whether due from or paid or allowed by one or more employers), exclusive of the value of all benefits and amenities not provided by way of monetary payment, exceeds Rs.50,000/-. employee and for this purpose. on or after 01.01.2004 or being an individual employed by any other employer, or any other assessee being an individual, a deduction of an amount paid or deposited out of his income chargeable to tax under a pension scheme as notified vide Notification F. N. 5/7/2003-ECB&PR dated 22.12.2003 National Pension System-NPS or as may be notifed by the Central Government. 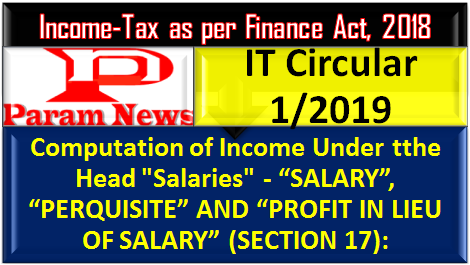 However, the deduction shall not exceed an amount equal to 10% of his salary(includes Dearness Allowance but excludes all other allowance and perquisites). As per section 80CCD(1B), an assessee referred to in 80CCD(1) shall be allowed an deduction in computation of his income, of the whole of the amount paid or deposited in the previous year in his account under the pension scheme notified or as may be notified by the Central Government, which shall not exceed Rs. 50,000. The deduction of Rs. 50,000 shall be allowed whether or not any deduction is allowed under sub-section(1). However, the same amount cannot be claimed both under sub-section (1) and sub-section (1B) of section 80CCD. Further, the amount received by the nominee, on the death of the assessee, on closure or opening of the pension not be deemed to be the income of the nominee. Further, it has been specified that w.e.f 01.04.09 any amount received by the employee from the New Pension Scheme shall be deemed not to have been received in the previous year if such amount is used for purchasing an annuity plan in the same previous year. It is emphasized that as per the section 80CCE the aggregate amount of deduction under sections 80C, 80CCC and Section 80CCD(1) shall not exceed Rs.1,50,000/-. The deduction allowed under section 80 CCD(1B) is an additional deduction in respect of any amount paid in the NPS upto Rs. 50,000/-. However, the contribution made by the Central Government or any other employer to a pension scheme u/s 80CCD(2) shall be excluded from the limit of Rs.1,50,000/- provided under this section. Section 80DDB allows a deduction in case of employee, who is resident in India, during the previous year, of any amount actually paid for the medical treatment of such disease or ailment as may be specified in the rules 11DD (1) for himself or a dependent. The deduction allowed is equal to the amount actually paid is in respect of the employee or his dependant or Rs. 40,000 whichever is less. Now the deduction can be allowed on the basis of a prescription from an oncologist, a urologist, nephrologist, a haematologist, an immunologist or such other specialist, as mentioned in Rule 11DD. However, the amount of the claim shall be reduced by the amount if any received from the insurer or reimbursed by the employer. Further in case of the person against whom such claim is made is a senior citizen (60 age years or more) then the deduction upto one lakh rupees is allowed. For the purpose of this section, in the case of an employee, "dependant" means individual, the spouse, children, parents, brothers and sisters of the employee or any of them, dependant wholly or mainly on the employee for his support and maintenance.